Connectors are words that link two clauses or two parts of the sentence to express relationships between ideas. For example, when you say “I’m happy because it’s my birthday”, you are expressing cause and effect, and are connecting two clauses with the word “because”. You need to use connectors to be able to express yourself in longer, natural sentences. Do you know how to use porque? And do you know when to use porque together as one word and when to use por que as two words? They mean different things. Learn it all here. It’s easy. Have you seen or heard já que before? I’m sure you will notice it now that you know it. Já que means because, since, as. It shows cause and effect between the sentences. Place a comma to separate the two sentences or parts of the sentence. Joana comprou um carro usado, já que ela quer economizar dinheiro para ir ao Brasil. = Joana bought a used car because she want to save money to go to Brazil. Já que você vai ficar no escritório até tarde hoje, vou pegar um cineminha com a Camila. = Since you’re going to be at the office until late today, I’m going to catch a movie with Camila. Pois can be used as a synonym of porque. Pois should never begin the sentence when used as porque. You should place a comma in front of pois when it means porque. Eu não vou para a festa, pois estou muito cansada. = I’m not going to the party because I’m very tired. Não posso tirar férias, pois estou muito ocupada no trabalho. = I can’t go on vacation because I’m very busy at work. Uma vez que also means because, since, as. It shows cause and effect between the two sentences or parts of the sentence. Nós nunca comemos em churrascaria, uma vez que o Mauro não come carne. = We never eat at steakhouses as Mauro doen’t eat meat. Fui embora cedo, uma vez que a festa não estava animada. = I left early since the party wasn’t fun. I hope you have fun speaking with a more varied vocabulary. It will make it easier to understand Brazilians and you will sound more natural. There is no reason to struggle with Portuguese! 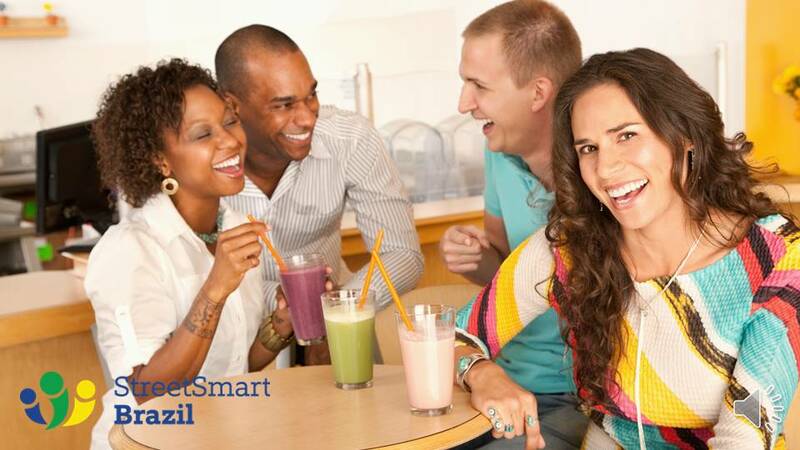 Street Smart Brazil has expert Brazilian Portuguese instructors to help you speak the language with ease. We offer one-on-one lessons via Skype, so you can learn from anywhere. Book a Trial Lesson with us! Hi my name is Marcel! Could you please give me the definition of Estava and Estive from the verb Estar, thank you very much. Oi, Marcel. These are two different verb tenses. Estava = conjugation for Eu and for Você/ele/ela in the Pretérito Imperfeito do Indicativo (Imperfect past). Estive = conjugation for Eu in the Pretérito Perfeito do Indicativo (Preterit).